35 cm tall (13.5 inches). 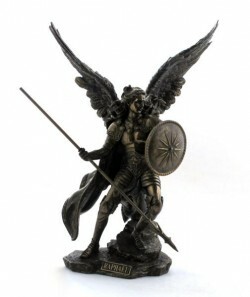 Bronze-finish warrior angel. Angel of Healing. A unique and eye-catching figurine for display in the home. Includes a collector's tag with extra info about Archangel Raphael.